In a dark time for elephants this is a story of hope. Fifty-three South African elephants that were at risk of being culled were safely moved to a new expansive home in Mozambique’s Zinave National Park. Wild Tomorrow Fund was proud to be a part of this large collaborative project. It’s not every day that you get to take part in an exercise to save Africa’s gentle giants. And it’s definitely not something you can do alone. Eight organizations including Wild Tomorrow Fund worked over three days across June and July to safely capture fifty-three elephants from two South African government reserves and move them to their new home in Mozambique’s Zinave National Park – a journey totaling 777 miles (1250 km) and spanning countries. Dr. Dave Cooper locating the elephants from the air. This elephant translocation, the largest in history for KwaZulu-Natal, South Africa, was a joint international effort. Conservation Solutions conducted the operation, Elephant, Rhino, People (ERP) primarily funded the move, iSimangaliso Wetland Park and Ezemvelo KZN Wildlife donated the elephants, manpower, and ground vehicles, Peace Parks Foundation and Mozambique government’s National Administration for Conservation Areas are responsible for offering the elephants a new safe home, and Wild Tomorrow Fund along with Elephant Cooperation funded the helicopter operations. Across Africa elephant populations are in crisis. A staggering 30% were lost between 2007 and 2014, primarily to poaching. That’s 144,000 elephants in just seven years - approximately 100 every day. However, the struggle to save elephants differs from country to country. Mozambique lost 53% of their elephant population in five years to poachers, while in South Africa the conservation challenge for elephants is habitat loss, with elephants running out of space within finite, fenced reserves. South African park managers are faced with limited options to manage their elephant populations that are contained within their reserves. The first option is contraception, used to slow breeding rates, but the long-term effects on fertility are not well understood and the process isn’t always effective. The second option is to increase the size of their habitat. This is done by connecting reserves via wildlife corridors or expanding existing reserves, but this takes time and large amounts of funding. If contraception and habitat increases are unsuccessful then only two options remain: relocating elephants to other reserves, or the tragic last resort - culling. Ground crews arrive on the scene and begin to stabilize the elephants. This was the case at both uMkhuze and iThala reserves in South Africa. They donated twenty-nine and twenty-four elephants respectively from their over-capacity reserves. iThala, an 86,487 acre (35,000 ha) reserve is home to 190 known elephants. This far exceeds its estimated carrying capacity. uMkhuze Reserve, managed by iSimangaliso Park, totals 111,197 acres (45,000 ha) and is in a similar situation with 200 known elephants. The 777 mile (250 km), 3 country-wide, route travelled by the 53 elephants. Returning elephants to a reserve where they had been poached out during Mozambique's civil war is a grave responsibility. Park managers had to ensure that the destination is now safe and adequately protected, that it is large enough for elephant numbers to increase, and that the habitat meets the biological, social and ecological needs for elephants. Zinave National Park ticked all of these boxes, an expansive and well-protected area covering one million acres (408,000 ha). In early 2016, the Peace Parks Foundation entered into a co-operative management agreement with the park, providing financial support, increased security, and resources to develop ecotourism and community conservancies at its edges. Peace Parks has already re-introduced more than 780 animals including impala, reedbuck, waterbuck and buffalo. Their re-wilding strategy aims to relocate an additional 7,000 animals over the next five years. The fifty-three elephants will join an already settled family group of thirteen who have been at the park for just over a year. Initially they will stay in a 45,962 acre (18,600 ha) fenced sanctuary section allowing them to learn their new environment and get to know each other while while being protected by an additional twenty-six newly trained rangers, as part of Zinave's anti-poaching strategy. 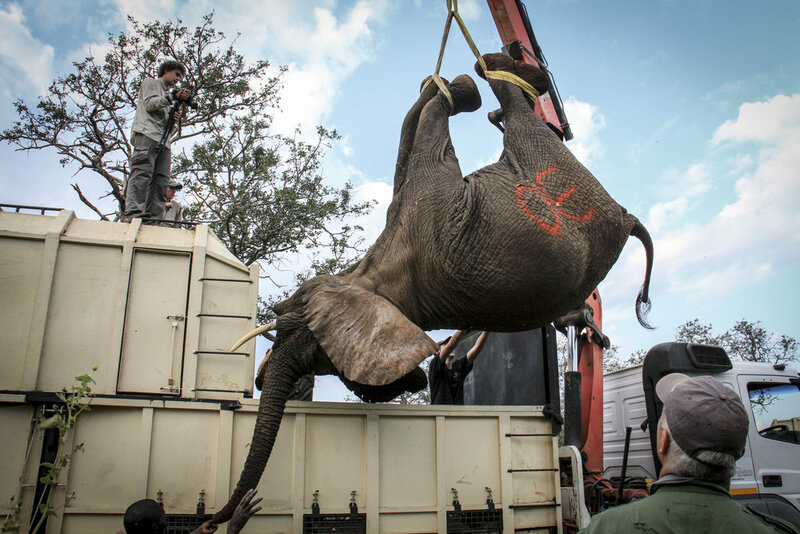 Transferring elephants onto the truck. Clinton Wright, Wild Tomorrow Fund’s senior ecologist explains: “At least now, these herds facing the possibility of being culled, will have ample space, water and food, and dedicated rangers to protect them.” And the good news gets better - this newly seeded elephant population is expected to double in size over the next 10 years! Thank you to all the organizations that made this move possible and together guaranteed a wild future for these precious African elephants. We look forward to continuing this story with updates on their progress in their new home at Zinave National Park in Mozambique. And a special thank you to Elephant Cooperation and those who attended our London fundraiser.